The cement floors, slab walls and exposed beams in this "dungeon" made it difficult to imagine any use for this space. 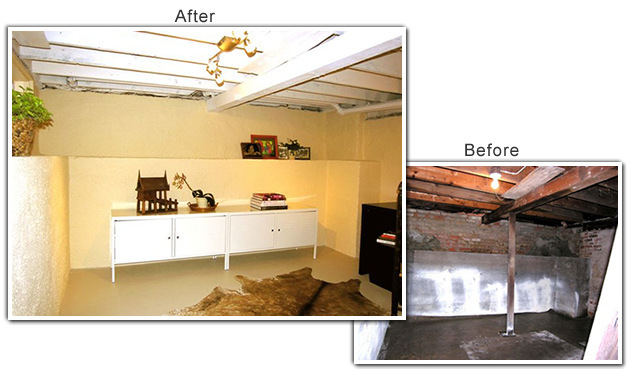 "Even cleaned up and scrubbed, it still felt dingy and gloomy," said Lori Matzke of Centerstagehome.com. The column was no longer supporting the beam, so it was removed and the concrete beneath it was repaired. After the walls and floors were washed down and allowed to dry thoroughly, a waterproof stucco was applied to the walls and left to cure for several days. This is a good do-it-yourself project, or you can hire a professional. To brighten up the space, the ceiling and beams were spray-painted a creamy shade of white. The stucco walls were given a coat of soft gold with an orange undertone. And the concrete floors were painted a pale shade of taupe-gray using an epoxy-based paint to seal out moisture. The old-fashioned pull-string lighting fixture was replaced with more contemporary track lighting with halogen bulbs. The new fixture brings a lot more light into the room. Inexpensive storage lockers placed next to one another look more like a substantial credenza and give the room a sense of function. Matzke used a variety of accents to downplay the fact that this is a cold basement. On the makeshift credenza there's a piece of wooden Asian art along with a collection of books and natural pine cones. Matzke painted the frame on a piece of artwork bright orange to give the farthest corner of the room more energy. On the desk, greenery and a soft orange ceramic lamp help brighten the space. A laptop on the desk gives the room a sense of livability. A desk, wooden storage bin and vintage chair were brought down from a secondary bedroom, and a cowhide rug was brought in from the guest room to soften the hard, cold concrete floor.